The musicality of the HBO series Insecure took a bit of a hit when the character Daniel exited stage left earlier this season, the series’ third. A love interest for Issa, Insecure‘s main protagonist, the aspiring music producer Daniel helped, simply through his presence, to transform the show’s wall-to-wall backing tracks into plot points, whether he was busy at work, or arguing with another musician about the arrangement of a new composition, or seducing Issa from behind his production desk. With Daniel now gone, we still have composer Raphael Saadiq’s score and Kier Lehman’s music supervision to artfully thread the needle between diegetic and non-diegetic sound, between what’s happening on-screen and what Insecure‘s writers want us to think and feel at any given moment. But this past week’s episode, “Obsessed-Like,” the season’s penultimate, leveled things up during one brief, spectacular moment. 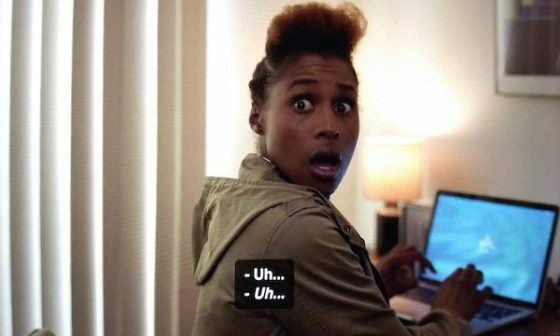 Insecure has always played with Issa’s inner monologues, which often occur when she’s alone in the bathroom. Those moments are tender not just because they are private, but because they show a more forthright and secure Issa than she generally acts in public. They often come in the form of short bursts of fledgling rap lyrics, part poetry slam, part self-aware stand-up comedy. They hint at where Issa the character may be headed. Perhaps — as with the Jerry of Seinfeld — the character Issa will become more like the actress Issa who portrays her. At one climactic point we see Issa in Nathan’s bedroom, where she is frantically trying to guess his laptop’s password. Her best friend, Molly, walks in on her, and to signal the way this moment presents an emotional rock bottom, Issa’s inner and public voices finally converge in an expression of utter shame — the “uh” of her internal monologue and the “uh” of her verbal response to a question from Molly harmonize with each other. They’re seen here in captions, the italics having, throughout the episode, signaled when Issa is talking to herself inside her head. Issa hasn’t recovered fully, but the delusions with which the episode opened seem to have been reconciled with — come into harmony with — reality. This evening, HBO will air the final episode of the third season of Insecure (which has already been renewed for a fourth). It is directed by Regina King, who played a lead character in the series Southland, the rare hour-long TV drama to air, for its full five-season run, without any background score. I wrote previously about the character Daniel’s presence on Insecure as a nuanced secondary figure we see making music.